When it comes to 4K TVs, one of the leading names in 2019 is Samsung. But what is the best Samsung 4K TV for gaming? And what makes Samsung TVs - specifically the QLED range - different to other panels? There's no doubt some of the best gaming TVs are Samsung models, from the mighty Q90R and Q9FN through to the NU8000 and the plucky NU6900, most Sammy panels are specifically tuned to enhance 4K play as well as the movies and TV you expect to see on your home TV. For our money, the QLED range easily matches LG's rival OLEDs, and the mid-range LED sets are so packed with features and gaming enhancements, that they're easy to recommend for anyone with a PS4, Xbox One, PC or Switch. 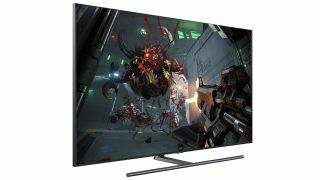 Let's start at the top with the very best Samsung 4K TVs for gaming. These are the QLED range, and they're split between 2019's models and those released in 2018. If you see a Samsung QLED with an R in the model number, that's a 2019 model. Anything with an F is 2018. QLED stands for Quantum Dot LED, and the main thing to know about this tech is that it makes colors brighter than any other type of panel. The top of the range QLEDs (Q90 / Q9) can manage about 2000 nits brightness, and the color contrast is incredible. To put that in perspective, your average HDR capable TV only manages about 400 nits. The UN series are 2018's regular models, while the RU series is new for 2019. The NU8000 and RU8000 are best tuned for gaming, with freeysnc, Steam Link, and high response rates as standard. However, all TVs in the NU and RU ranges are above average for gaming, so it really comes down to your budget. If you're looking to save money, there are some Samsung models in our best 4K TVs for under $500. Pros: The brightest panels on the market at 2000 nits and no more tearing. The perfect technology if you need to beat sunlight coming out of multiple windows or want that wow effect in the night. Both 2019 and 2018 QLEDs like the Q90R and Q9F get so bright, they can light up a pitch black room. So far few games really leverage the full potential of HDR, but Red Dead 2 and Shadow of the Tom Raider to, and it's stunning in Netflix productions like Lost in Space and Star Trek Discovery (UK). The technology itself is a reinvention of LEDs: Quantum Dots use unique lighting dots between two and ten nanometers that produce different colors depending on their size. That's the reason why red tones are deep red, and an ocean scene can leverage multiple different blue tones without sacrificing picture clarity. Cons: Seriously good, but not perfect black levels: OLEDs switch off their organic pixels, so black is black. QLEDs are very close, it's tough to notice a difference in most scenes, but OLED still wins out here. OLED presents the better experience in games that completely play in darkness like Batman: Arkham Knight even though colorful characters like Poison Ivy look more stunning on QLED. You can read our breakdown of the best LG TVs for gaming right here, which includes a discussion of OLED. But really: In a side-by-side comparison of a dimly lit beautiful night scene with a blue horizon in Sea of Thieves on Xbox One X, it's tough to spot a difference between Samsung Q9F and the LG 65E8 - our winner of the LG feature. QLED is also as expensive as OLED, so there's no real cost difference. No tearing, excellent HDR: Is QLED the most future-proof technology? HDR already was the star of our LG OLED feature, because it allows for a higher dynamic range of luminosity in each image. Creatives can decide scene by scene which color temperature at which brightness level they want to use. Traditionally on any LED set, you can just choose between lower or higher color temperature and brightness level. This results in an unbalanced picture when you play Rise of the Tomb Raider because games, like movies, have a different need for a different color temperature in almost every scene. When Lara is climbing up mountains, HDR highlights the perfect white snow, that on a QLED is displayed at around 1.700 nits. It’s stunning, still feels natural because snow actually has strong sun reflections. When Lara looks down, however, the picture needs to be toned down slowly, so that you feel the extreme height she is operating in. On QLED the TV switches permanently between maximum brightness and darkness to create the right atmosphere per scene. Rockstar loves to highlight fires within pitch black darkness with an orange glow in Red Dead Redemption 2. QLEDs, in general, are optimized for gaming: Samsung uses Variable Refresh Rates (VRR) for their panels which means the TV synchronizes the refresh rate with your console. Traditionally whenever your device outputs fewer frames than your TVs signature refresh rate, there is tearing. Especially on Xbox One X which already uses VRR, we had no tearing problems on QLED in fast shooters like Doom. There's a caveat here, in that we haven't been able to fully test the Q90R yet, which is the successor to the Q9F. However, the Q90R is also way more expensive, and the difference between the two sets is fairly minimal, with the Q90R actually reducing default brightness on Game Mode. The Samsung Q9F, meanwhile, is a stunning piece of technology. The bezel-free design featuring a black aluminum stand is a luxurious addition to any living room. It's one of the few TVs that don't require external audio, the sound is excellent. The panel peaks at 2000 nits brightness, that lights up a pitch black room in no time. Due to full array local dimming, so the use of 480 separate LEDs, the black levels go almost as deep as on OLED. There is no color bleeding, no light bleeding, no clouding when watching from a center position. If you play from an angle, there is a slight sliver of light touching through on the upper right and left corner. You have to search for it, but it's there. Now let's talk about brightness: boy is this bright. It's stunning. At night, especially, but also during the day. With all windows opened and direct sun breaking into the house, the picture clarity is one the best I've ever experienced on a TV set. If you are ready to spend £3,000/$3500, this is the best QLED and overall LED you can buy. Features a more elegant design than the Q9F with a curved display and a brushed aluminum stand with a very long curve that looks stunning in the living room. The Q9F, unfortunately, is just available as a flat panel while curved looks sexier and is slightly more immersive. Especially in games like Titanfall 2, where you are sitting in a titan, and the curved experience gives you the feeling of being encapsulated in its cockpit. If you sit close enough, there is a notable difference in how you enjoy entertainment, both in games and Netflix. The impressive wide color gamut results in vibrant and saturated colors and thanks to the extremely high HDR peak brightness, highlights really pop and shine when compared with SDR content. While the Q7C (as a 2017 model) can't offer the perfect black levels of his 2018 colleague, it's much cheaper and as fast: 24 ms at 4K@60 Hz is perfect for Doom and Overwatch. It's perfect for games and maybe a little more affordable than the absolute top of the range. Are there true budget QLED options? Yes, at £,800/$1000 the Q6FN isn't excessively pricey but is still a good set. Obviously, it's the entry class peaking at 1.500 nits, which is still brighter than every other LED on the market and the HDR quality is really good for the lower end price class. If you are less of a Netflix aficionado and you play a lot of shooters like Battlefield 5, Call of Duty or Rainbow Six: Siege, you don't need these extreme brightness levels. They are mostly leveraged by single player experiences like Rise of the Tomb Raider, Uncharted 4 or the upcoming Metro Exodus. The Q6 uses edge LEDs, meaning LEDs are not spread over the entire panel but built into the side which means less perfect black levels. This is not the most high-class TV experience you can get, but the most affordable QLED set you can buy. It's a good looking TV, it's fast, color reproduction is excellent, only viewing angles aren't that great. It's more built for long nights with one person next to you, less of a party and sports TV to watch SuperBowl and Champions League with 20 friends. You can also drop down to a 49-inch model, if you really want a great TV but don't quite have the budget for 55-inch. Should you buy a Samsung QLED in 2019? OLED versus QLED, that’s almost a question of religion. It’s very tough to say which is better because each has its advantages: OLED, without a doubt, still rocks the deeper blacks, so if you consume a lot of content that plays mostly in the night and that’s important for you - go OLED. QLED beats OLED when it comes to picture clarity, processing and especially color reproduction. Reds, blues, yellows, greens - every color looks stunning on a QLED panel. Especially if you watch Avengers: Infinity War with these screaming, bright colors or play a game like Uncharted 4 or Overwatch, that doesn’t use natural colors but prefers to wow the audience. Samsung also manages to build some of the best audio systems we’ve ever heard into its premium QLEDs. On top of that: it’s safe technology. While OLED requires a decent amount of care to avoid burn-in at high brightness levels, with QLED and Active HDR you can always go 'all-in' on your TV settings without any risk of damage to the set. Panels are also super fast, perfect for our review games like Doom, Overwatch, Titanfall 2 and the Call of Duty: Black Ops 4 Beta. QLED is here to stay, that’s for sure, and for gamers it has the edge over OLED. Just.